At the 68th session of the United Nations, 2016 was formally declared to be the “International Year of Pulses”. .
Pulses are types of leguminous crops which are harvested for their dry seed. Dried beans, lentils and peas are the most commonly known and consumed types of pulses. I have grown Black Turtle beans for several years now. We use them in both soups and salads. I grew a couple of other types of drying beans last year – Tarbais and Taylor Horticultural beans. I got the seeds of all three varieties originally from West Coast Seeds. I found them quite easy to grow and just wish I had more space as the amount I can produce certainly doesn’t last through the year. I’ve saved the Black bean seeds each year and replanted them, I’ll do the same with others this year and try a couple more varieties. Pulses are a great source of plant-based protein, iron, folate and anti-oxidants. They have 4x the fibre of brown rice, amino acids and other essential nutrients. They are great for a wide range of diet options, a good choice for sustainable agriculture, water efficient, affordable and extremely versatile in terms of meals. They are easily found in the grocery store both dry and canned. Red lentils are also grown locally here in Saanichton at Saanichton Farm (see Links). If you go to pulsepledge.com you can sign up for the pulse challenge. This is committing to eating pulses once a week for 10 weeks and joining a global food movement. You will get tips, recipes and the chance to win prizes. from “Spilling the Beans” by Julie Van Rosendaal and Sue Duncan. I served it over rice and had the leftovers for lunch the next day, it was really tasty. 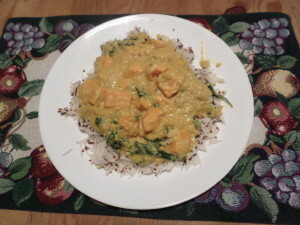 It was a very mild curry, you could increase the spices if you wanted it to be a bit hotter.